‘Tis the season to be jolly, right? Well, the malls are crowded, it’s impossible to find a parking spot at Costco, and our bank accounts are slowly being depleted. Why? Because we let the importance of stuff overshadow what is really important. I am just as guilty as the next person. It’s easy to get caught up in the hustle and bustle of the season. But, perhaps this holiday season you and your family can join us in taking a different approach. Instead of focusing on what each of my kids want to receive for Christmas, we plan to discuss with them the importance of giving over receiving, the joy that comes in sharing with those in need, and how this Christmas season is less about the stuff and more about the celebration of Jesus’ birth. 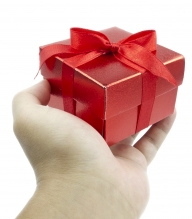 The holidays are a perfect time to teach the importance of charitable giving. This sacrificial act may show itself in many forms and may look different for each family. Some years we have filled shoeboxes for Operation Christmas Child, others we have adopted needy families within our community, and yet other times we’ve given our time to bring some cheer to the lonely. However it looks, sharing with those less fortunate than us can inspire feelings of satisfaction and contentment; pure joy. Giving back shouldn’t end after this season is over, though. Kidworth – a free tool designed to teach kids financial goal setting – makes meeting goals for giving so easy and worry-free. By choosing a share goal with your children, or in creating your own, you are teaching the value of giving and how important it is to think of others. This post was sponsored by Kidworth. All thoughts and opinions are my own. Do you have the “50 tips for Dads of Daughters” in print? They were very good bits of advice! I might like to purchase a copy. Thanks! Not currently, but watch here for updates!